The South Side is Looking Good! I took a walk down the street the other day and although it was sweltering outside it was so nice to walk on the new brick paver sidewalks. 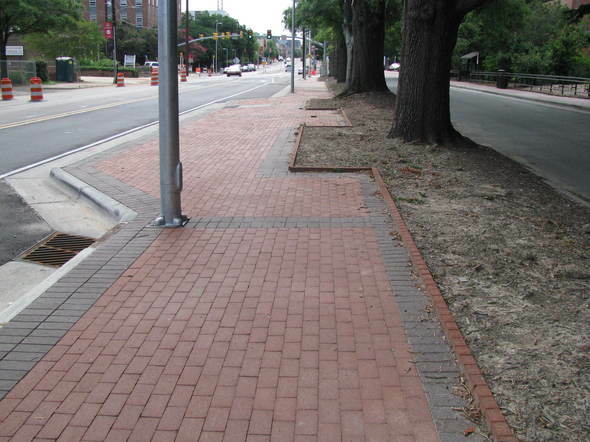 The south side of Hillsborough street is basically complete, there are a few details that are still pending, but the sidewalk and underground utilities are up and running along the south side. Now, on to the North Side! Construction activities on the north side have officially started, which means that the pedestrian corridor has shifted to the south side of the street. 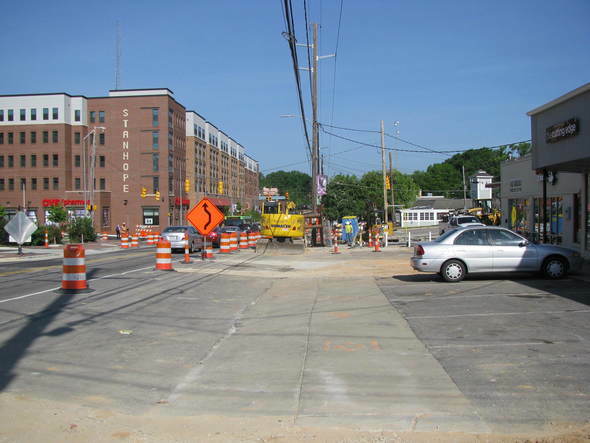 For your safety, please follow the pedestrian detours along the construction corridor. Currently, the contractor is focusing on storm drains between Dixie Trail and Bagwell Avenue, and on underground utilities at Bagwell Avenue. 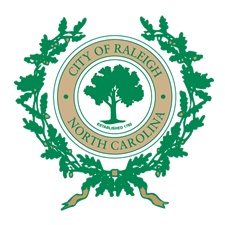 Bagwell Avenue is closed to traffic at the Hillsborough Street intersection. The contractor anticipates the street to stay closed through the beginning of August, while they install a sanitary sewer main, a water main, storm drains electrical and telecommunication conduits and new curb and gutter. The parking lot on Bagwell Avenue for Hangover Grill, Wings Over Raleigh, Marco’s Pizza, Cutting Edge, and Good Guy Vapes is still accessible from Everett Street to Bagwell Avenue. 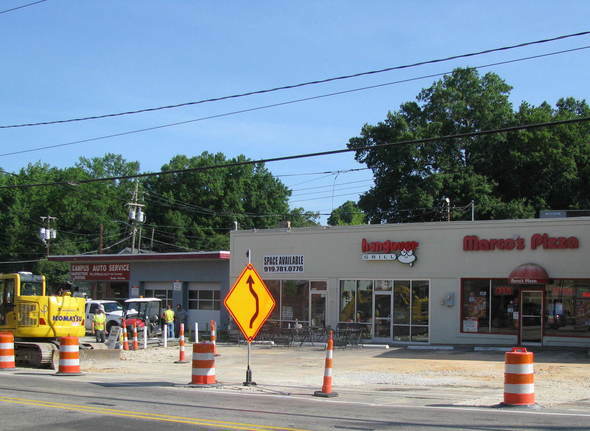 A crew is currently working on stormwater pipes in front of the building housing Hang Over Grill, Wings Over Raleigh, Marco’s Pizza, Cutting Edge, and Good Guy Vapes. Access to the businesses is available either in front or by using the parking lot located at the rear of the building, accessed from Everett Street to Bagwell Avenue. Once the stormwater is complete at this block, the crew will install the storm drains on Bagwell Avenue. Starting next week a team is scheduled to start installing the sanitary sewer main that runs from Bagwell Avenue to Brooks Avenue. This work will be completed primarily during the daytime hours and businesses affected will be J&J Auto, Checkers Pizza & Subs, Subway, and Wolf Mart. There will be access points available for the businesses during this work, and the businesses are open with their regular hours of operation. We held our July Construction Update Meeting on Tuesday, July 11 at East Village Grill & Bar, and we were happy to see a couple of new faces. The Project Manager, Richard Dickie, went over some of the details pertaining to the upcoming work along the north side of the corridor and spoke to the construction schedule and completion date of the project. Our next Construction update meeting will be on Tuesday, August 8, at 2 p.m. at the East Village Grill & Bar. The meetings are an excellent way to hear about upcoming activity and voice any concerns you may have about the project. We encourage the business and property owners along the north side of Hillsborough Street to attend and learn how the project is going to affect your property. Until next time, remember to be safe in the work zone!